Home » Archive by category "Desserts, Creams & Sauces"
Create the best Valentine’s Day dessert ever! All you bake is a 10-minute crust! 2. Butter the springform pan (bottom only); place parchment circle inside pan bottom and gently press so that it sticks. Set aside. 3. In a 2-cup mixing bowl, using a fork, mix the graham cracker crumbs, sugar and butter together until uniform. 4. Transfer the graham cracker crumb mixture to springform pan. 5. With the fork, smooth out the crust ingredients up to the pan edges. With your fingers, press the crust evenly. 6. Bake the crust on a rack set in center of oven for 10 minutes. After 10 minutes, transfer the pan with crust to a counter or trivet to cool. 1. In a 2 or 3-quart glass or porcelain bowl, slowly add the boiling water to the Jell-O® mix until it is all dissolved. Keep stirring the mix with a spoon until you no longer see the pink powder. 2. Transfer the bowl with liquid Jell-O® to refrigerator, uncovered, for about 10 to 15 minutes. It should be cool, NOT SET. 3. In the meantime, in a stand mixer bowl (or a bowl using a handheld electric cake mixer), beat together the cream cheese, sugar and vanilla extract. 4. Beat at high speed until mixture is uniform. Set bowl with cream cheese mixture aside. 5. If using a stand mixer, transfer the cream cheese mixture to another large bowl – you will now use the stand mixer bowl to beat the whipping cream. 6. In a clean 4-quart bowl and using a handheld mixer (or the stand mixer bowl), beat the whipping cream on high speed until stiff peaks form. 7. Using a spatula, gently and gradually (a little at a time) stir the raspberry Jell-O® liquid into the whipped cream. 8. Mix it slowly until the mixture is evenly-colored (reddish-pink). 9. Then, with a handheld wire whisk or spatula, gently and slowly add the whipped cream mixture to the cream cheese filling in bowl. Mix until it is all evenly-colored. 10. Pour the raspberry cream cheese filling into the prepared springform pan. 11. Transfer the cheesecake to refrigerator – uncovered – for 6 hours or overnight. 1. Take a knife and run it between pan sides and cheesecake. 2. Carefully/slowly release sides of springform pan. 3. Place cheesecake (with bottom of pan) on a serving platter and decorate it. Serve. Note: Cheesecake keeps (refrigerated) up to 5 days. Looking for a refreshing and beautiful summer treat? You found it here! 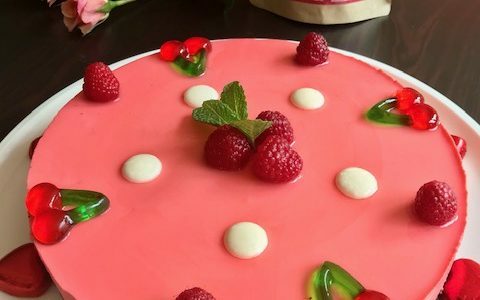 The strawberry gelatin and the mascarpone cream elements of this dessert take 15 minutes each to prepare. While you sleep (overnight), this Strawberry Mascarpone Terrine will chill all by itself! The next day, just slice and serve – easy enough, right? 1. Lightly oil the loaf pan and set aside. 2. In a small bowl or cup, mix together the Knox gelatin with water; set aside. 3. Wash & immediately pat dry all the strawberries – set 8 strawberries aside for later use. 4. Hull the remaining strawberries; discard green stems. 5. Cut up the hulled strawberries into 1/2-inch pieces; place them in a 4-quart saucepot. 6. Add water and lemon juice to the strawberries in saucepot. 7. Bring the strawberry mixture to a boil; with a potato masher, smash the strawberries as they cook and soften. 8. After 5 minutes of cooking, stir the sugar and the set gelatin into the hot strawberry mixture. 9. Mash the strawberry mixture well so that all ingredients are blended and gelatin dissolves. 10. Transfer the hot strawberry gelatin mixture into prepared loaf pan. 11. Set the loaf pan with strawberry gelatin mixture in refrigerator to set – about 2 hours or overnight. 1. In a small bowl or cup, mix together the Knox gelatin and the water until dissolved; set aside. 2. In a stand mixer bowl or in a 1-quart mixing bowl with a hand mixer, beat together the Mascarpone cheese, yogurt, sugar and lemon juice. Set aside. 3. In a small saucepot set on low heat, dissolve the set gelatin with 2 tablespoons heavy whipping cream for 30 seconds to 1 minute. DO NOT LET MIXTURE SCORCH! 4. Gently stir the gelatin-cream mixture into the Mascarpone cream mixture. 5. Divide the Mascarpone cream mixture in half. 6. Add the pistachios to one-half of the Mascarpone cream mixture; set aside. 7. Take 4 of the reserved strawberries and hull them; discard green stems. 8. Chop the hulled strawberries into 1/2-inch pieces. 9. Add the chopped strawberries to the remaining half of the Mascarpone cream mixture; set aside. 10. 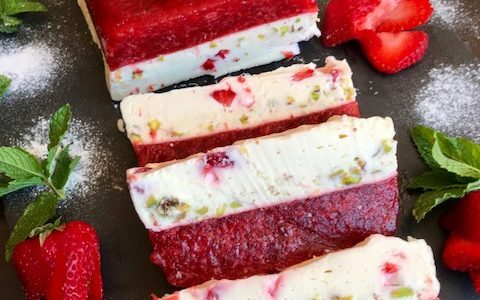 Gently spoon the Mascarpone cream with pistachios over the set strawberry gelatin in loaf pan. 11. Next, spoon the Mascarpone cream with strawberries over the pistachio Mascarpone cream. 12. Refrigerate the Strawberry-Mascarpone Terrine for at least 3 hours or overnight. 13. At serving time, garnish the dessert with remaining strawberries, mint leaf springs; dust with powdered sugar. Slice and serve. This dessert is based on multi-colored cubes of Jell-O, mixed with evaporated and condensed milks with vanilla. All you have to do is assemble the ingredients in a Bundt pan and unmold the set gelatin. Isn’t it cool? That’s right – our Mosaic Gelatin Dessert is beautiful to look at, cool and refreshing. Enjoy it for our July 4th weekend holiday! Make Mosaic Gelatin Dessert the next day and set overnight. 1. Prepare each Jell-O recipe according to package directions, but use 1/8 cup less water for each box (this will ensure a firmer Jell-O for cutting into cubes later). 2. When making each Jell-O recipe, prepare it in a 10 X 10-inch square glass or porcelain baking dish. 3. Refrigerate each Jell-O recipe 6 hours or overnight, uncovered. 4. After the Jell-O’s have set completely, cut each Jell-O into long, 1/2-inch thick strips. 5. Cut each strip into a 1/2-inch cube. 6. As you cut and amass cubes of Jell-0, gently transfer them to a 12-cup Bundt pan; set aside. 7. Pour the 4 envelopes of gelatin into a 2-cup bowl. Add the water, mix and let it stand; set aside. 8. In a blender, combine the Knox set gelatin, condensed milk, Nestle Media Crema, evaporated milk and vanilla. 9. Puree the milk and gelatin mixture until uniform. 10. Gently pour the milk mixture over Jell-O cubes in Bundt pan. 11. Transfer the gelatin in Bundt pan to a refrigerator and let it set overnight, uncovered. 12. When ready to serve, place the Bundt pan in a large bowl filled with hot water. 13. Run a knife between edges of Bundt pan and gelatin dessert. Lift Bundt pan out of water and twist it in the air to loosen the gelatin dessert. 14. Place a platter over the gelatin dessert in Bundt pan and quickly invert. 15. Garnish with fresh mint leaf sprigs and serve immediately. Red is the color of passion, don’t you agree? 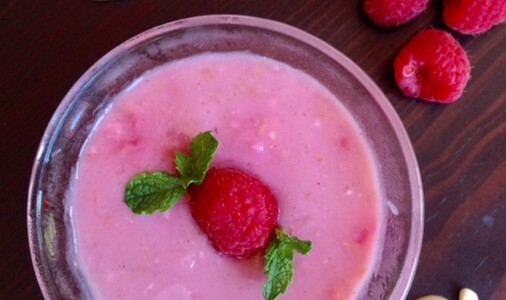 This pudding gets its rich color from natural, red raspberries. Enjoy this recipe as a Valentine’s Day dessert or treat. Have fun! 1. Stir the cinnamon, rice flour, ground almonds and sugar together in a 4-quart saucepot. 2. Gradually pour the milk (a little at a time) and 1 teapoon rosewater into the saucepot, constantly stirring with a wooden spoon. 3. Bring milk mixture to a boil and simmer for 3 minutes or until it thickens slightly. 4. At this point, stir the fruit into the milk pudding. The fruit should partially disintegrate as it cooks. 5. Cook the pudding on low heat for about 2 minutes, stirring constantly, until the fruit has added color to the mixture. 6. At this point, taste pudding and adjust rosewater level, if needed. 7. After 2 minutes, transfer the pudding to a glass or porcelain bowl and cover it with plastic wrap (this will prevent forming a skin). 8. Set pudding aside to cool on a counter for about one hour. After one hour, transfer the pudding to the refrigerator. 9. Chill the pudding until it is completely cold (about 4 hours or overnight). 10. Divide pudding among 6 to 8 individual bowls. Garnish the pudding with a raspberry and mint leaf sprig. These sweets are a traditional Christmastime dessert in Naples. They are small balls of fried dough that are dipped in honey and sprinkled with decorative candies. At your holiday table, this struffoli platter will steal the show! 1. Line a baking sheet with parchment paper; sprinkle the sheet with semolina and set aside. 2. Line another sheet or platter with double paper towels (this will be used to drain the fried struffoli); set aside. 3. In a mixing bowl, beat together the eggs, lemon zest and 1 tablespoon oil until mixture is uniform. 4. Gradually (a little at a time) add about 1-1/2 cups flour and baking powder to form a dough. 5. If dough is too sticky, add about 1 to 2 tablespoons more flour until the dough is formed and pliable. It should be smooth. 6. Take the dough out of the bowl and place it on a lightly-floured surface. 7. You will barely have to knead the dough, coating it with a LIGHT amount of flour until it no longer sticks to your hands. 1. Tear off a marble-sized piece of dough and roll it with your hands. 2. Set the ball aside on the lightly-floured parchment sheet on baking dish. 3. Repeat rolling instructions until all the dough has been rolled into marble-sized balls. 1.Heat 1 quart oil in a wide, heavy pan or saucepot at 375°F (the oil should be 6 inches deep). 2. Gently lower about 12 dough balls at a time into the hot oil. They will first sink and then, as they cook, they will float up to the surface and begin to turn golden brown. 3. Make sure to roll them around with a slotted spoon so that they do not burn underneath and instead, evenly turn light golden brown. THIS WILL TAKE LESS THAN A MINUTE. NOTE: Struffoli should not blacken. 4. When struffoli are light golden brown, immediately transfer them to the paper towel-lined sheet or platter. 5. Continue frying the struffoli in batches, making sure to control the heat if it is too high or too low. 1. Place a serving platter close to you on a counter; set aside. 2. Transfer the spun honey into a 2 to 4-quart saucepot. 3. Add 1/3 cup cold water to the honey in saucepot and warm up the mixture. 4. When the honey mixture begins to bubble and foam, add a slotted spoonful of struffoli to the honey. 5. Immediately STIR GENTLY ONCE as you lift out the struffoli from the warm honey. NOTE: MAKE SURE THE HONEY DOES NOT BUBBLE UP AND OUT OF THE SAUCEPOT – CONTROL THE HEAT SETTING ON LOW. 6. Let them drip slightly over the honey pot and quickly transfer them to center of platter. 7. Work quickly to repeat coating the struffoli, lifting and draining them and then transferring struffoli to the platter – SHAPE THE MOUND OF STRUFFOLI INTO A CONE OR PYRAMID. 8. When all struffoli have been set on platter, immediately sprinkle them with the non-pareils candies. 9. Set platter of struffoli aside until ready to serve. 10. If you need to cover struffoli, lightly oil a sheet of plastic wrap and set it over the platter.